Tapping is clinically proven to lower food cravings, improve emotional wellbeing and result in weight loss without dieting. But what is tapping, why does it work, and how can YOU make the most of this exciting and easy-to-learn technique? ✔︎ What tapping actually is! ✔︎ How your brain’s emotion & addiction centres respond to tapping. ✔︎ Why tapping works (both eastern wisdom & hard science views). ✔︎ The moment I realized the power of EFT! ✔ How to tap (follow along and solve a problem almost EVERYONE has). ✔︎ Why tapping requires mindfulness and not distraction. ✔︎ That tapping is not weirder than other things (like overeating). 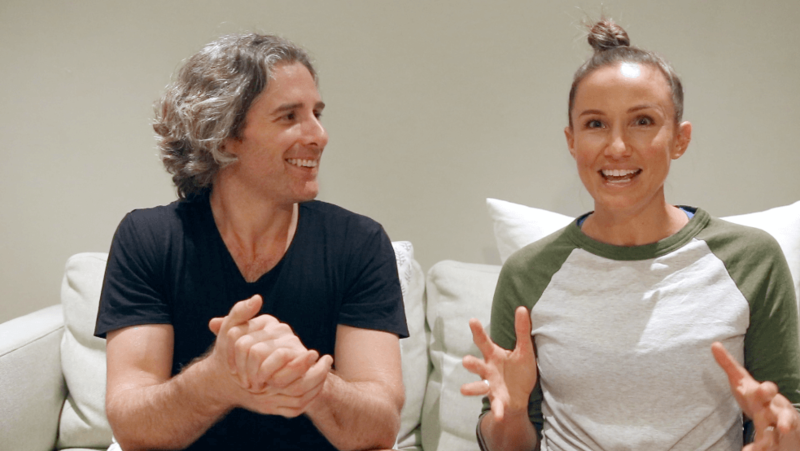 If you love this chat and feel like you need a helping hand to fully experience the benefits of tapping for yourself, we have a fully online program that will help you apply to power of tapping to eliminate food cravings while still being able to eat your favourite foods, eat well without having to think about it, feel better in general and lose weight without dieting. Libby: Hi everyone, I’m Libby Babet, and this is the wonderful Glenn Mackintosh, AKA the Weight Psych. Glenn: That is a great intro. Libby: It’s a good intro. How are you, Glenn? Glenn: I’m better for that intro. Glenn: A strategy, a technique, a tool. Libby: Strategy! That’s better. A tool. He says it much better than I do. Glenn: We’re gonna do this cool thing with you today, guys. Libby: This cool thing. Which is all about emotional freedom. It’s an emotional freedom technique, otherwise knows as, tapping. Glenn: Yeah. So we call it emotional freedom techniques or sometimes we call it to EFT, but we just often call it tapping because what we’re doing is we’re combining psychological therapy with tapping on acupressure points. It’s a combo of Western psychology and Chinese medicine, which is a little bit different but really cool. Libby: Yeah, that’s a cool little relationship, partnership there. So how does it work? I’m so curious. I’ve heard you talk about it so many times. Glenn: … and certainly not sure how it works. Libby: Or how to use it. But let’s start on how it works. Glenn: So from an Eastern medicine perspective, what we’re doing is, we’re balancing out your energy, or your chi. Glenn: Now to be honest, I don’t know a lot about Eastern medicine. And you don’t have to either. Glenn: What makes the most sense for me as a psychologist is there’s research to show that it turns off the limbic system in your brain. Libby: Okay, what does that mean? Glenn: Please, you guys know this right? The limbic system is associated with emotions, memories, and it’s part of the addiction loop in your brain. Glenn: Yeah, so it’s a way to turn off unpleasant feelings. It’s also a great way to deal with unpleasant memories. But the way that I got into it was through the research that it’s really good for getting rid of food cravings of course because a food craving is your emotion linked with your memory and it’s part of that addiction, pleasure pathway. So it’s all those things. Libby: So now you’re speaking our language. This is a way to deal with food cravings. Libby: Amazing. Now it does sound a little bit different, a little bit wacky. So what’s the hard science behind it? Glenn: Yes! That’s such a good question, Lib, because as you know, I’ve been working in the psychology of eating space and the weight management space for quite a while, since before I had grey hairs. Libby: Yes, about 15-odd years to be precise. [crosstalk 00:03:06] without those. Libby: It suits you! I think it suits him. Glenn: I’ll take it, I’ll take it. So … lost my train of thought now. Libby: So, yeah. The science. And what I’ve been saying to people is, there’s no evidence yet that this helps people with my area so I’ll wait until the evidence comes out. And it turns out this person was one of the people in the initial tapping for food cravings trial. Libby: Oh, wow, that’s cool. Glenn: Yeah, so I knew it was coming up. And I kept my ear out for it. And then when I read it, it was almost like, Libby, reading that first study, I became an advocate right there. Glenn: What we found was that people’s food cravings went right down. Glenn: They felt like they had more power over food rather than food being in control of them. Glenn: They felt better emotionally. So just generally. Glenn: They didn’t diet, so they weren’t dieting in their mindset. Libby: Which we know is important. Glenn: Massively important. And they lost just a little tiny bit of weight. So like okay, that’s cool. That was a month after the trial. Glenn: In six months, all of those benefits had maintained apart from the weight loss, had gone from about point two of a kilo, so a tiny little bit, to two and a half kilos. Libby: Wow! Which is a huge result! Libby: And to keep off and continue to lose over six months. Libby: You may have some knives with this incredible tapping deal. Glenn: At one year, the average weight loss for people in the trail was five and a half kilos. Glenn: Still weren’t dieting, still have no food cravings. In fact when they called these people up, they were asked in the trial to focus on their favourite food, not surprisingly the most favourite food that people struggle with was chocolate, and about half of the people forgot about their favourite food. Glenn: They didn’t even remember that they had a problem with it. Libby: Okay. I’m liking this science, everyone. This is good. So I don’t know about you but I just want to try it. Can we try it? Glenn: Yeah we can try it. Libby: Can we do it here? Glenn: We can take you through a crash course on it. Libby: Crash course, I’m down with that. Glenn: And what we’ll do is, we’ll provide a link just for you guys where you can check out all of the info, you can check out the studies on that. There’s a little animation we did up with exactly how to fix your amygdala and the limbic system. There’s everything you’d need to know. Libby: So you’ve got a while course on this, right? Online. Glenn: We have, I’m so proud of this, Libs, we have an eight module course and a 12 module course that go through tapping for everything weight management. Glenn: … mindfulness. We cover everything. In fact everything we’ve talked about in this whole series, we do tapping for. Libby: Okay, amazing. So we’re not going to get all that right now, but we can have the crash course. Come on, I’m keen. Let’s do it. Glenn: So what we do when we tap, is we always … Even though it’s such a positive technique, we’re actually every time we’re focusing on the problem. So you don’t tap unless you have a problem. It’s not like a daily meditation type thing. You can do it daily but you always have to do it with a problem in mind. The problem could be anything. Glenn: So when you think of a problem, typically a problem might be a food craving. Glenn: … I want to eat, instead you can tap the emotion out. Glenn: Let’s start with something that all of us will have. And what we’ll do is once we identify the problem, we rate the problem on a scale of 0 being none at all to 10 being the worse it could possibly be. Glenn: So what we’re gonna start off with is something that we all tend to have a little bit. We’re gonna start with the problem of having slightly constricted breathing. Glenn: So we’re going to rate the constriction in our breath. We’ve been sitting on this couch. And I want you guys to do this, too. We’re going to rate it on a scale of one to 10. So I want you to just take a deep breath. And then if if was the fullest, deepest, most relaxed breath you’d ever had, you’d be 0, there’s no constriction. Or if it was like, get the crash cart ready, you’d be a nine or a 10. Glenn: Yeah, exactly. So where do you feel you are, Lib? Libby: I feel like that was maybe a four or five. Glenn: Four or five, so a little bit that you noticed there. Glenn: Yeah, I recognise maybe a five or a six. I think I could do it a little better. Libby: Could do with a stretch. So whatever your number is, what I want you to do is tap along with me and we focus on the problem with a combination of tapping on acupressure points and we use statements to help us focus on the problem. So we’re actually verbalising the problem. Glenn: So if you just follow after me, Lib, and I want you to actually say it after me. And if you’re watching it at home, I want you to say it. Because the verbalising is an important part of it, especially at the start. Libby: Okay. And 0 is not constricted, 10 is constricted. Libby: Okay. So definitely I reckon more a five for me. Glenn: So we start off tapping on the karate-chop point. And I’ll talk you through the points really quickly. So the first point is the karate-chop point. Then we’re gonna to up to the eyebrow point, so it’s just where your eyebrow ends. Beautiful. Libby: Okay, got it, got it, got it. Glenn: Then the side of your eye. Glenn: Yup, just on the side of your eye there. Then below your eye. So just sort of tracing around your face. Then below your nose. We’ll provide a little tapping cheat-sheet. Glenn: So you can get the points. Glenn: Yup. Just see that little indent in your chin there? Collarbone point which is a funny one because it’s not actually on your collarbone, it’s in this little fleshy bit below. Glenn: Then below your arm. Just four fingers … I like to use three or four fingers to tap on this point, make sure you get it. And then right up on the top of your head, just the top of your head. Then you take a breath. So that’s what we call a round of tapping. Glenn: People always think that. Libby: I know! But then definitely going from like a five level to like, a one or two. Libby: Like, that was a much … it was weird because before, I was trying to breathe really deep, but that one it felt like I was breathing clearer. Glenn: Yeah, Lib took a really long one. I was like, waiting for her, it’s like, “Okay … ” Those are nice. Libby: I was trying for perfect on the first … But yeah, that was really … it felt really clear as well as deep. Glenn: Beautiful. So you’re about a one. Libby: Yeah. I think so. Glenn: So you’ve done really well. Let me … I’m still a three or a four and I notice a little bit of tightness right up in my muscles around my back. So the full technique … And often when you just do the points you’ll get a benefit. But the full technique is actually focusing on the problem by verbalising statements. And I’m imagining there’d be some people out there who might be a six or a seven or an eight. And if they’ve gone down to a four or a five, it’s still there. So let’s do the whole technique. Glenn: Okay. So tapping on the karate-chop point. And we’re gonna say a setup statement which helps us get really focused on the problem and we’ll say it three times. So if you just repeat after me. And you guys, too. Say the words. It’ll sound a bit funny. Libby: Yeah, eating a tub of ice cream. So. Even though I’ve got this restriction in my breathing, I love and accept myself. Libby: Okay. Even though I’ve got this constriction in my breathing, I love and accept myself. Glenn: Beautiful. We say that three times. Even though I’ve got this restriction in my breathing, I love and accept myself. Libby: Even though I’ve got this restriction in my breathing, I love and accept myself. Glenn: And last one. Even though I’ve got this restriction in my breathing, I love and accept myself. Glenn: Beautiful. So when you’re doing this at home, you just use your words. You might say, “Even though it’s hard to breathe” or “Even though I feel this tightness in my chest,” or whatever it is. You just use your own words. The words are just to help you focus on the problem. And then we go up to the eyebrow point. We don’t have to say the whole thing. We say what we call reminder phrases. So it’s just like a word or a phrase that helps us focus on the problem. Libby: I’m gonna go with that, too. Tightness in my back. Libby: Tightness in my shoulders. Glenn: And as you’re saying it, you actually want to focus on it. This is not a distraction technique. People say, “Oh, does this work really well because I’m distracting myself?” It’s not. It works better when you focus on the problem. Glenn: This constriction in my breath. Libby: This constriction in my breath. Glenn: Little bit hard to breathe. Libby: Little bit hard to breathe. Glenn: This tightness in my chest and back. Libby: This tightness in my chest and back. Glenn: Then you take a breath. So I’m at about a three or a four. Libby: Yeah, I’ve just felt really … It was weird, actually. It felt like this … a similar thing, I’m getting really close to feeling just like, that felt really good, deep, clear breath. Glenn: So when we do this with a food craving, the problem is the desire for the food. Libby: Just take it away. Yeah. That’s really interesting. I’m definitely going to try that with food cravings. 100 percent. Glenn: Give it a go. Libby: Yes, and wants to try it. Glenn: … is just to give it a go. Tapping is not dependent on the placebo effect, so you don’t even have to believe it to work for it to work. So if you believe it enough to give it a go, it’ll work for you. Libby: Yeah. I like that. It’s definitely worth a go. I mean and also it’s one of those things that we talked about, in a previous episode of this we talked about how you know, having a balloon which was your … you’ll see when you watch that video. But all your stressors and all your cravings and all that kind of stuff, and where’s the release valve? And this could be a release valve. Glenn: It’s a wonderful release valve. It’s a great way to deal with emotional eating. We do find research says that about 17 percent of our non-hungry eating is due to emotions. So don’t be surprised if you’re tapping away a food craving and then you tap that away and then suddenly you want something else, you tap that away and then you want something else and then you think, “What’s behind all of this?” And then you start to tap on some of the feelings. So in our online programme, every week is one module apart from our emotional eating module which is two weeks. Glenn: We go through all of the different feelings and really teach you how to tap through all of those feelings. Glenn: Give it a go. You guys, too. Libby: … Next time I’m procrastinating, tapping. Libby: Get tapping! Let’s do it. Hey Buddy!, I found this information for you: "The Benefits of Tapping (Interview with Libby Babet)". Here is the website link: https://www.weightmanagementpsychology.com.au/the-benefits-of-tapping-interview-with-libby-babet/. Thank you.